Big guy in a little motion capture suit. Conventional motion capture rigs -- the ones that use visual markers and arrays of infrared cameras -- cost tens of thousands of dollars, making them prohibitively expensive for everyone but major studios. 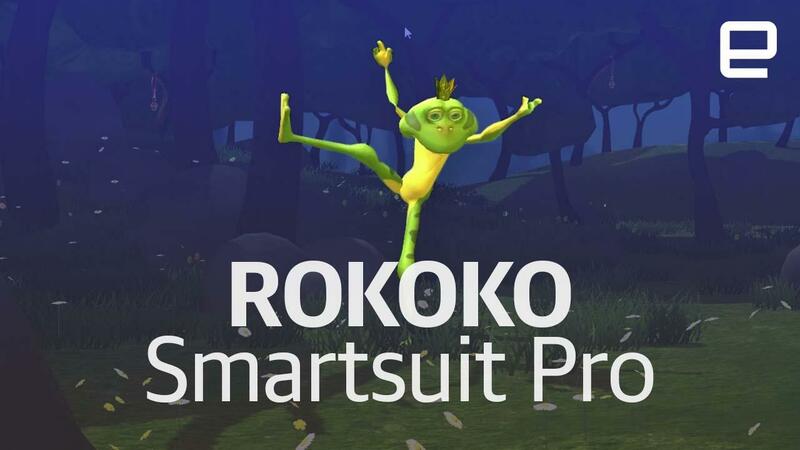 But a new, cameraless system from Danish startup Rokoko, called the Smartsuit Pro, aims to make Hollywood-quality motion capture affordable for everybody. The Smartsuit Pro is a form-fitting jumpsuit equipped with 19 gyroscopic sensors. These detect the angle, momentum and position of your head, arms, legs and torso, then feed that information into a central hub on your lower back. The data can either be recorded locally on the hub's hard drive or streamed directly to a computer using WiFi. You'll get about 6 hours of use out of the suit before it needs to be recharged, though its batteries can easily be hot-swapped. Given its $2500 price point, the Smartsuit Pro is geared primarily towards independent filmmakers and game developers. I was recently afforded a chance to don the suit and transform myself into a digital anthropomorphic frog. It went about as well as you'd expect. The Smartsuit is essentially a snug jumpsuit with a headband and spandex hand and foot cuffs. Getting into the suit is easy enough (even if the one I tried was a size too small): just slide your feet in and pull the suit up around you. I would not recommend wearing street clothes underneath because, even though the suit itself is breathable, using it over multiple layers and jumping around still means you're going to get sweaty, and fast. Well not actually jumping -- that's one of two motions that the system doesn't handle yet. The other is laying flat on your back as that blocks the hub's WiFi signal, though that's not an issue if you're recording locally. Once you've squeezed into the suit, you'll need to calibrate it to your personal measurements and the heights of various body parts, then stand at attention with your arms flat at your sides so that the system can sync your movements with those of your onscreen avatar. From there, you're free to do your thing. The system continually records the signals generated from each of its sensors as you move. Interestingly, it doesn't actually generate that much data compared to traditional MoCap systems since its all telemetry information rather than video from a huge camera array. Plus it can all be easily exported directly to a variety of animation platforms, like Unity, Blender or Maya. Rokoko announced on Tuesday that it is shipping its initial batch of 300 suits to its pre-order customers and will begin retailing the devices on its website. The company also working on motion-capture gloves, which it hopes to have ready by the end of the year, as well as an even more affordable motion capture suit for hobbyists and amateuers some time in 2018.